The Boston Red Sox went 69-93 in the 2012 season. Their worst record since 1965. Like most Red Sox fans, I was miserable all summer. 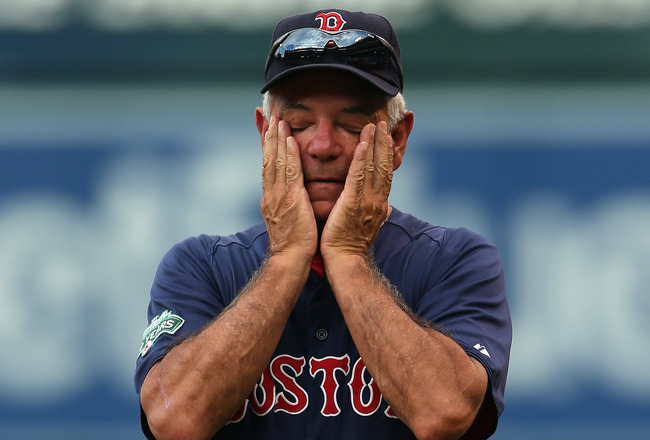 In fact, I was miserable since late November, when the Red Sox brass inexplicably decided to hire the worst man possible for the job in Bobby Valentine. This wasn’t just hindsight being 20/20. If you comb our archives, there is a post I wrote on November 4, 2011 titled “The Search for a Manager” after Terry Francona left Boston. The basic gist of that post was making sure the Red Sox hired anyone but Bobby V.
11 months later, I am here at my laptop, and the Red Sox are again without a manager. A lot has changed in Boston though. Adrian Gonzalez, who was supposed to remind us of Manny Ramirez, is out in LA along with Carl Crawford, and Josh Beckett. There are more holes in the lineup card that accompany the vacancy on the top step of the dugout. Will they give David Ortiz the contract he wants? Will they re-sign Cody Ross? Are they going to go into an all out youth movement? Will they explore trading Jacoby Ellsbury? The manager search doesn’t really concern me much because Bobby V is no longer available. Dave Martinez, Sandy Alomar, and Bill Mueller are all guys that I would really like to see manage the Sox. John Farrell and Mike Scioscia will either have to get fired or the Red Sox would have to trade for them. I can’t really think of any candidates that I absolutely don’t want like Bobby V last season. I trust that the franchise is okay this time around with whomever they decide to hire. 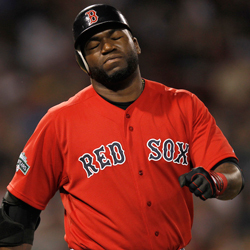 Midway through the 2012 season, I started to think the Red Sox should give David Ortiz a Kevin Garnett like contract. 3 years $30 million would shut Ortiz up for a while, it would allow him to retire a Red Sox, and at the time he was performing at a high enough level to warrant that type of offer. Then he injured his Achilles running the bases and was essentially out for the season. This injury changed my mindset on Ortiz. He is only asked to DH and he can’t stay on the field. I would offer him a 2 year deal for $18 million. I only offer him the multi-year deal because of what he has meant to the Red Sox organization the last 10 years. The Red Sox are wise enough to know there isn’t much of a market for Ortiz being jus a DH. The fact that he wasn’t able to play a whole season also plays into the Red Sox favor when they sit down at the contract table. If Ortiz digs his heels in and proves difficult to re-sign, the Red Sox do have fall back options. 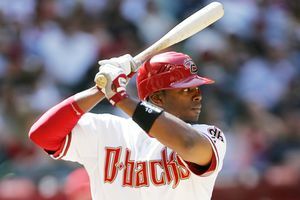 There have been numerous reports out of Arizona that GM Kevin Towers will explore the trade market for Justin Upton. The 2005 first overall pick is just 25 years old. He is a five tool player. Put Upton in right field. This would allow you to move Cody Ross to left once you re-sign him, or he could even become your DH. Because Upton is just 25 years old I feel its ok to give up your prospects. Upton would be a part of the youth movement. In my eyes only Matt Barnes is your truly untouchable prospect. Go ahead and trade Xander Bogearts, Jackie Bradley, Allen Webster, and Bryce Brentz. I believe the return you are getting here is much more valuable than question marks that are in the farm system. It was no secret the Red Sox pitching this season was terrible at best. The staff ERA was over 5. In fact the staff was so bad, there were people actually excited that John Lackey was coming back next season. As it stands right now the Red Sox will head into Spring Training with a rotation of Jon Lester, Clay Buchholz, John Lackey, Felix Doubront, and Franklin Morales. The nice thing about that last sentence is it didn’t include the name Daisuke Matsuzaka. Daniel Bard will have the entire winter to get over his mental breakdown in 2012. It is my hope that whoever manages the Red Sox will keep Bard in the 8th inning to set up Andrew Bailey where he belongs. Morales will be in the rotation depending on the development of Rubby De La Rosa. Zack Grenike is available in free agency and the Red Sox should avoid him like the plague. Greinke’s mental health issues are well documented and we have seen many players come through Boston and show they could not handle the environment. Imagine what will happen to Grenike? The only free agent pitcher that genuinely interests me would be Dan Haren but I fear his price tag will be a bit exorbitant. As far as trade targets, a guy I have wanted for years might be available in Matt Garza. Garza proved when he was with the Rays that he can pitch in the toughest division in baseball. Garza is just 28, so he might command a similar package to that which would be required to land Justin Upton. The other interesting trade target is Josh Johnson. My problem with him, however, is the man just can’t stay healthy. I have real reservations sending away top prospects for someone who isn’t reliable. While there is a part of me to see Adrian Gonzalez gone, I have to be realistic and acknowledge his departure leaves a rather large hole in the lineup and at first base. James Loney came to Boston as a part of the AGone deal and in 30 games he just .230. with 2 home runs and 8 RBI. His best season was in 2008 when he hit .289 with 13 home runs and 90 RBI. There isn’t much else out there in the first baseman market. I am not excited about James Loney coming back to Boston, but I think the Red Sox can get him back dirt cheap and he will be serviceable for them. I’d say sign Mike Napoli to play first base just so the Sox don’t have to oppose him any longer but that theory proved wrong with Carl Crawford. He also suffered a major regression the second half of the season. The other options are Adam LaRoche (who will be overpaid by someone this winter) and Nick Swisher. Truth be told, I would love to see Swisher in a Red Sox uniform but I know that won’t happen. I hope the Red Sox don’t get involved in the Josh Hamilton sweepstakes. I don’t care about his history and all that jazz. I am more concerned about paying someone top dollar from the ages of 35 and on. Alex Rodriguez is a prime example of why not to give massive contracts to athletes in the twilight of their careers. Hamilton will turn 32 next season and he figures to command at least an 8 year contract in the neighborhood of $175 million. Lastly, the Red Sox will need to figure out what they want to do at shortstop. I would like to see them give Jose Iglesias the nod in 2013. I can probably hit better than him but his defense is outstanding. I believe in run prevention and Iglesias in my opinion could help out that starting rotation quite a bit. He gets to balls that he has no business getting to. I’ll tolerate the .200 batting average if it means outstanding defense. Bat him ninth, let him sacrifice bunt whenever he can, and let him learn how to hit big league pitching on the job. There is no one really available via free agency either. I expect this offseason to be interesting for the Red Sox. I am hoping management is just as sick of losing as the fan base is. I miss the days of 2004 and 2007. The Red Sox have not made the playoffs since 2009 and in that year they were swept by the Angels. I sincerely hope that the Boston Red Sox are at rock bottom right now because I can’t imagine it being any worse.